Just before we traveled to the beach, I realized I needed to get Kaye a backpack. You know, to put her personal stuff and toys for her to carry. Since it was a last minute thing, I shopped at the trusty Target where I know I can find good stuff. Plus they were having a sale on kids backpacks for $9. But OK. So I went a little late in the week and the backpack rack was pretty much cleared. All the $9 bags were slim pickin’ with yellow, red or purple colors. And Kaye, of course, had to have pink. It’s her signature color. The only pink backpacks left were the ones with cartoon characters (not my style) at a much higher price (not in my budget). I made her choose- yellow, red or purple. She settled for purple. 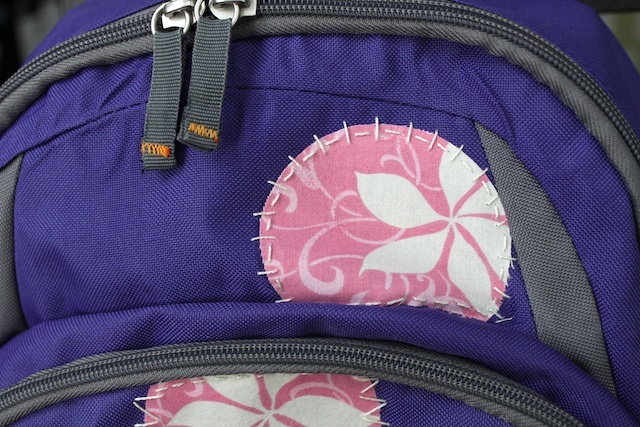 Since she was such a good sport about it all, I came up with the idea to appliqué some pink on the bag. 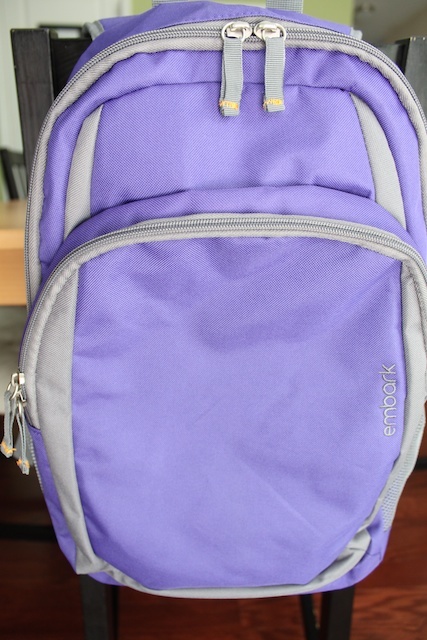 But also, I’m sure there are hundreds of kids out there with the same $9 Target backpack. I wanted hers to stand out from the crowd. And since I’m doing a back to school week here on Simply Modern Mom, I thought this would be the perfect back to school tutorial. 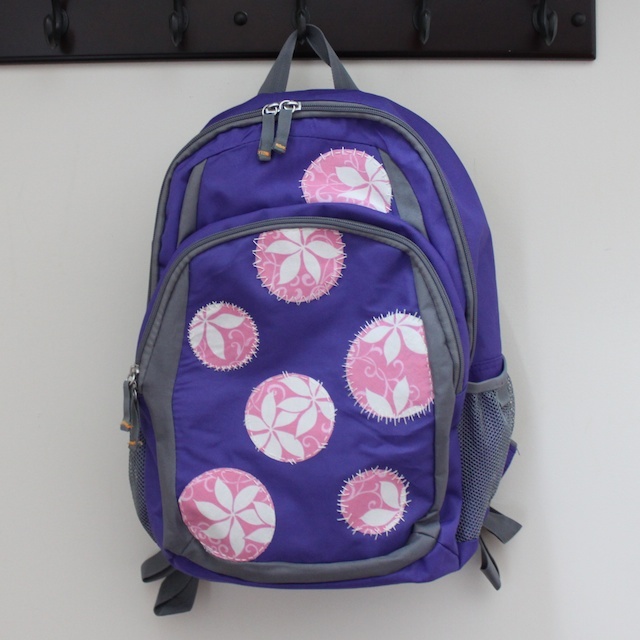 Personalize your child’s backpack with some appliqué. If you made something inspired by Simply Modern Mom, please upload pictures of it in our Flickr group to show it off to everyone. You may be featured on Simply Modern Mom. 1. 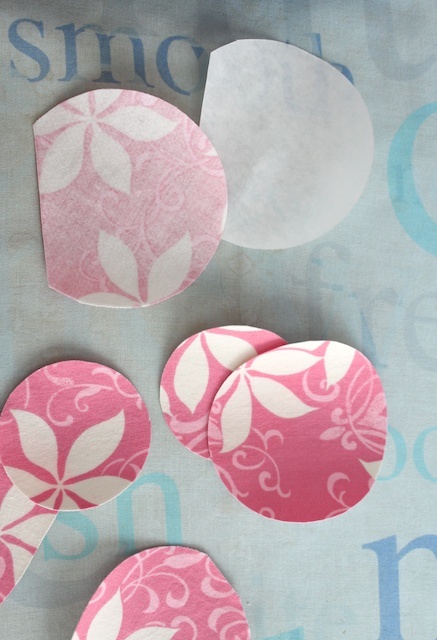 Sketch your design on to paper then cut out. Kaye loves polka dots. So I went with that. Easy enough. I also thought of doing a large K for her name. Or perhaps some designs of modern birds. Get creative with what your child likes. In my case, I grabbed a few round objects from the kitchen. 2. 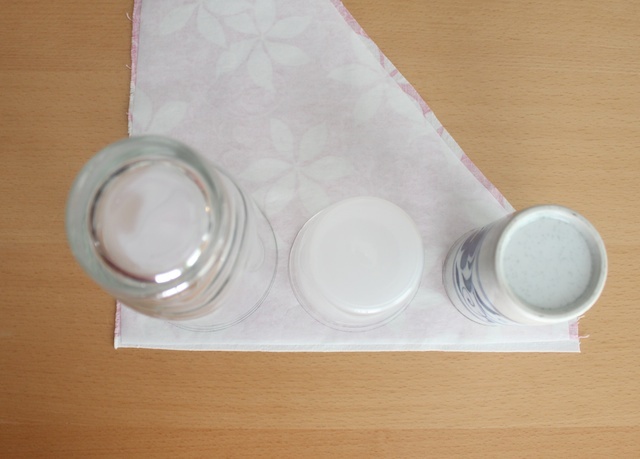 Place your scrap pieces on the Heat’n Bond and trace it. 2. 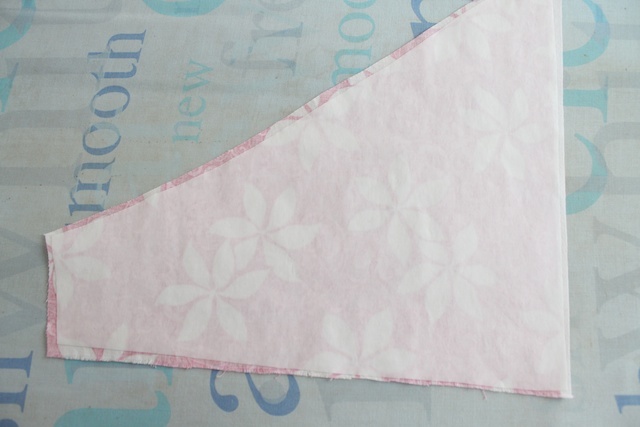 Cut your appliqué webbing slightly smaller than the scrap fabric all the way around. Then following the package instructions, iron the webbing on the wrong side of the fabric with the paper side of the webbing up. 3. Trace the shapes and pieces of the template you created in #1. You should be tracing the templates onto the paper side of the webbing. Then cut out your shapes. 4. 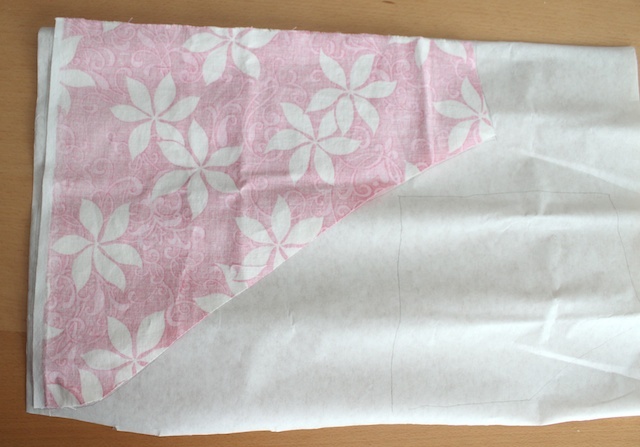 Place the pattern on the bag to determine where they will go. 5. 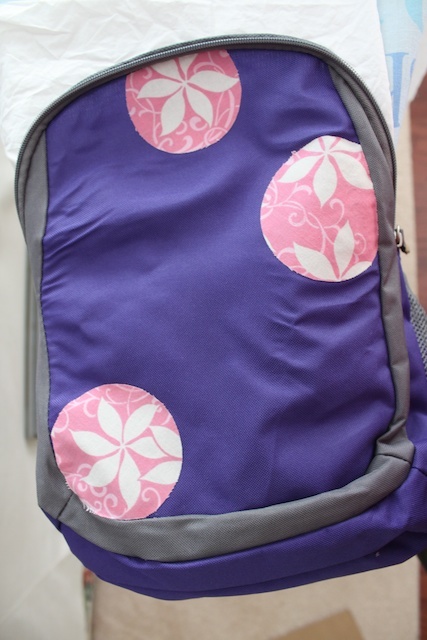 Peel off the paper backing and iron on the patterns onto the backpack. The bag I used was made of polyester. Having the iron on low silk setting didn’t affect the polyester much. But please read the tags on your backpack to figure out the right temperature settings for your bag material. Make sure to iron the edges well. 6. Using the Heat’n Bond ultra hold on the thick polyester material on the bag, I do not recommend using a sewing machine to finish the appliqué edges. So I hand stitched different types of stitching to finish the circles. 7. 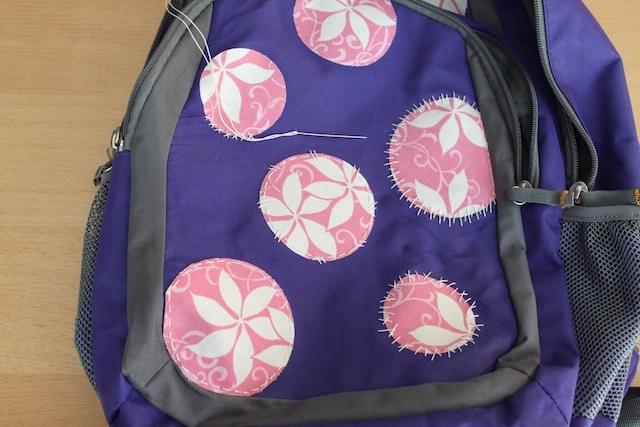 Using the needle and thread, hand stitch the edges of the appliqué to help it last longer. Kaye loves it. 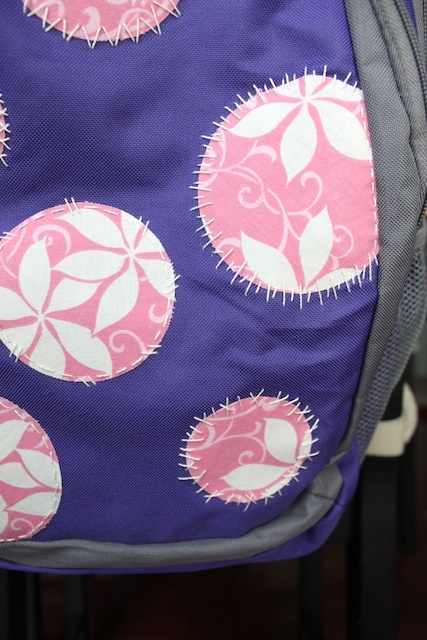 When she saw me working on it, she thanked me for making her bag pink. My 13-year-old cousin liked it too. That’s good, right? 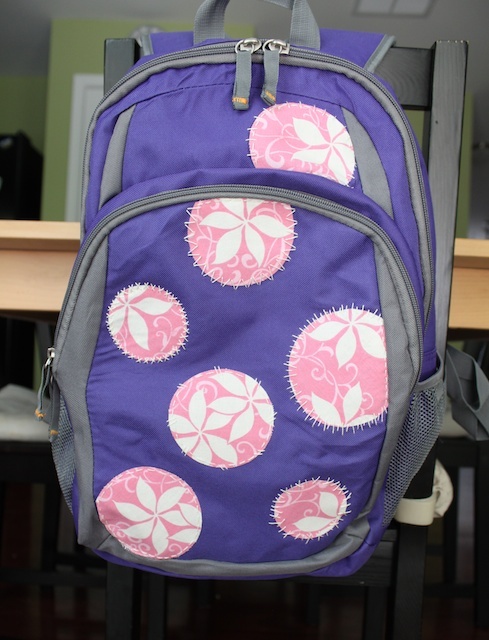 » Tell me… How do you personalize your child’s backpack? 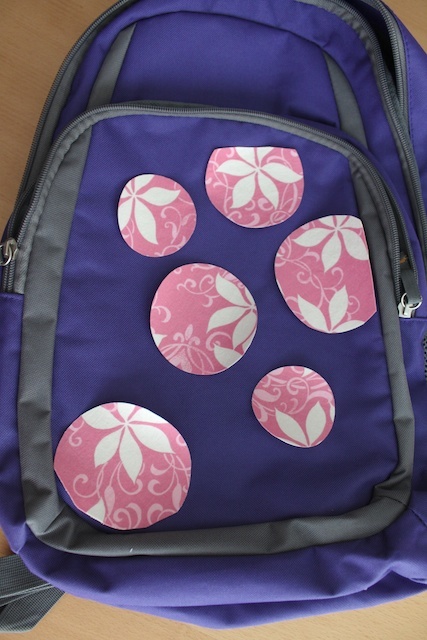 Or how do you label your children’s backpacks so it doesn’t get lost? My daughter and I agree that the appliques look great! Much better than our Sharpie approach last year. So cute! and such a good idea. Awesome idea! I have twins and this would be a wonderful way to personalize similar bags! That is so cute. I love these appliques! Thanks so much, I’ll be linking. Those dots really jazz up that backpack. Super idea!